The flip side of yesterday’s amazing spectacle for the Philadelphia Phillies was the transportation. My morning commute, which normally averages about one hour if I stop for coffee, lasted two-and-a-half hours. I live in the exurbs between Philadelphia and Harrisburg. When I boarded the train at 7:30am, it was already standing room only. Closer to the city, trains actually stopped taking people on board because there simply wasn’t room. Supposedly, frustrated travellers started walking onto the tracks at one stop in an attempt to force trains to accept more passengers. By the time I arrived at City Hall around 9:30am, people had already packed the bleachers on JFK Boulevard and wrapped around the corner towards Broad Street. Walking down Broad Street, I had to squeeze through groups with parties in progress. Drinking would not cease at any point in the day. Going home was almost worse. Thousands gathered in Suburban Station, a SEPTA station located underground near City Hall. I actually had to walk from City Hall down to 30th Street Station, the main train station in the city, because all other forms of transportation were too full. When I entered 30th Street, people were lined up, shoulder-to-shoulder, wall-to-wall. Lines formed randomly without most knowing to which train or track the line belonged. Train station employees counted passengers carefully, stuffing as many on each train as humanly possible. Given the sheer numbers, I’m sure there were some who had to wait for second and third trains to arrive. And Amtrak and Septa were not running additional lines. 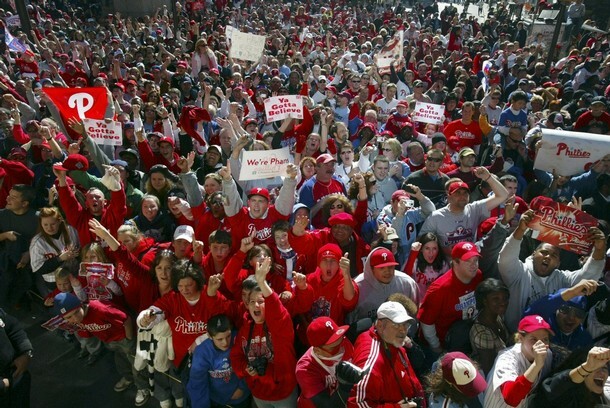 The public transportation system currently isn’t arranged to handle an influx of people such as the one that accompanied the Phillies parade. What most impressed me about these crowds was their behavior. Despite all the drunkeness, all the delays, and all the confusion, people were genuinely happy to be there. Almost everyone greeted one another with smiles and a hearty “Go Phillies!” cheer. The impact that a World Series Championship can have on a tough-as-nails town is simply astounding. ← Philly Phanatic!!! It’s parade day, everyone!